The Eurosystem's Extended Asset Purchase Programme was announced on 22 January 2015. 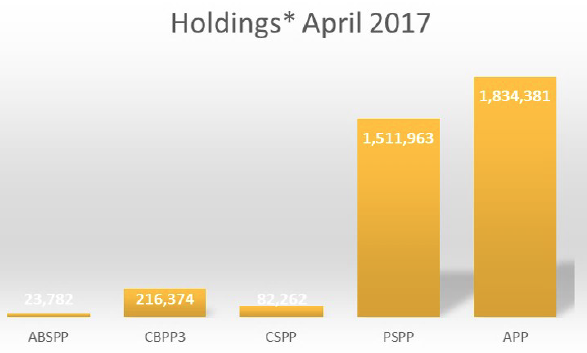 The main component has been acquisitions of government bonds under the Public Sector Asset Purchase Programme (PSPP) (see Figure 1). In March 2016, the size of the programme was scaled up from €60 billion to €80 billion per month. By the end of April 2017, the Eurosystem's balance sheet contained €1.8 trillion of assets, mainly as a consequence of asset purchase programmes. Notes: ABSPP: Asset Backed Securities Purchase Programme; CBPP3: Third Covered Bond Purchase Programme; CSPP: Corporate Sector Purchase Programme; PSPP: Public Sector Purchase Programme; APP: Total. In a new paper, we analyse the portfolio rebalancing effects of the programme (Bua and Dunne 2017). There are several channels through which asset purchases are understood to transmit to economic effects (Krishnamurthy and Vissing-Jorgensen 2011). The most direct effect is simply a rise in the price of assets targeted for purchase. Holders require higher prices to encourage them to divest an asset that they usually prefer to hold (or that they are mandated to hold). Planned purchases of bonds with long terms to maturity also reduce required risk premiums, and lower expectations of future short-term interest rates. Portfolio rebalancing (the redirection of funds usually invested in PSPP assets into other assets) may further increase price pressure on non-PSPP assets – even more than that directly caused by a lower discount rate. Investment displaced by ECB purchases may, however, flow into cash holdings or to corporate bonds and equities abroad, instead of at home. As such, there may be less dramatic price effects in Eurozone bond and equity markets from the purchases. Cash holdings will also generally lead to limited additional economic effects if there is already plenty of liquidity in the banking system. In the case of foreign asset substitution there will possibly be a rise in the values of foreign currencies (a weakening of the euro), boosting competitiveness and external demand. We use the rebalancing data of actively managed investment funds domiciled and reporting in Ireland (particularly those that hold PSPP assets), covering Q1 2014 to Q3 2016. The total asset value of the entire sector in Q3 2016 was about €2 trillion. Our dataset includes all investment funds categorised as equity, bond, mixed, hedge, real estate, money market, and others. Irish investment funds focused on PSPP assets are roughly 20%, and a representative fraction, of European funds in this category.2 We focus on asset type, region of issuance, and original maturity in the portfolio composition. Compared to previous studies, our dataset allows us to examine both end-quarter stock positions and within-quarter flows (transactions as percentage of total assets) for each asset class. Figures 2 and 3 plot the average end-of-quarter proportional portfolio compositions according to asset type and maturity. Figure 2 includes only the main types – that is, cases where on average the asset type represents more than 4% of the total assets held by the funds. Note that cash holdings represent such a small component of fund portfolios that we do not show them in the proportional stock positions. 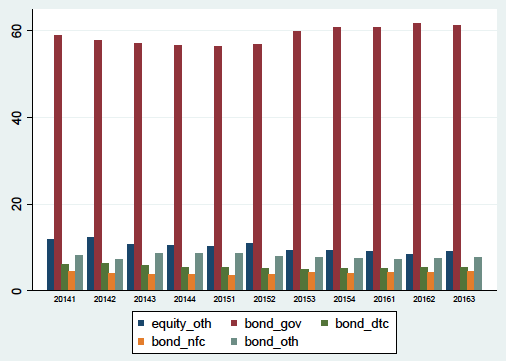 This is not surprising, since the investment funds we analysed are not mandated to hold such assets.3 Figure 3 shows that, on average, funds were heavily concentrated on government bonds with maturity greater than two years. The proportional holdings of government bonds had clearly increased since the start of the ECB's asset programme. This is mainly a consequence of revaluation effects (that is, passive changes in portfolio compositions due to variable price changes of the portfolio components). Notes: equity_oth: equity not issued by corporates excluding financial institutions; bonds_gov: bonds issued by governments; bonds_dtc: bonds issued by deposit-taking corporations; bonds_nfc: bonds issued by non-financial corporates; bonds_oth: bonds issued by other entities. The transactions data are more insightful. Figures 4, 5 and 6 show net purchases of different categories of assets. They show a different picture. 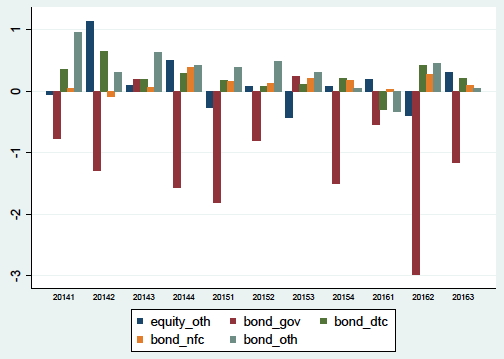 On a net basis, Figure 4 shows that funds had sold euro-denominated government bonds. Figure 5 indicates that sales were mainly of assets with maturity longer than two years. Funds had also moved into other types of bonds. Figure 6 shows net purchases according to the region of issuance. There was strong evidence of net selling of Eurozone government bonds in all 11 quarters,. In nine out of 11 quarters, however, we also record net purchases of government bonds that had been issued outside the Eurozone. Most net purchases of bonds issued by deposit-taking corporations were of bonds issued outside the Eurozone. The figures suggest some extensive elements of a portfolio rebalancing channel, with a sizable foreign component regardless of asset type. 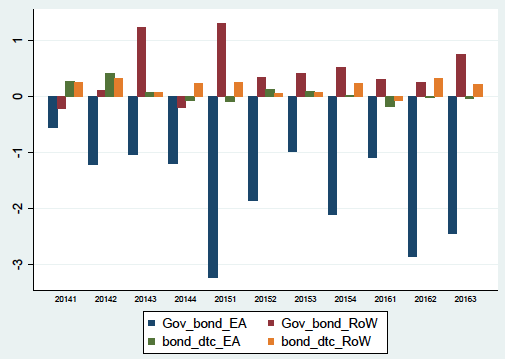 Notes: Gov_bond_EA: bonds issued by EA governments; Gov_bond_RoW: bonds issued by rest of world governments; bonds_dtc_EA: bonds issued by EA deposit taking corporations; bonds_dtc_RoW: bonds issued by Rest of World deposit taking corporations. Other causes obscure the rebalancing attributable to the purchase programme, so we cannot make conclusions on graphical analysis alone. 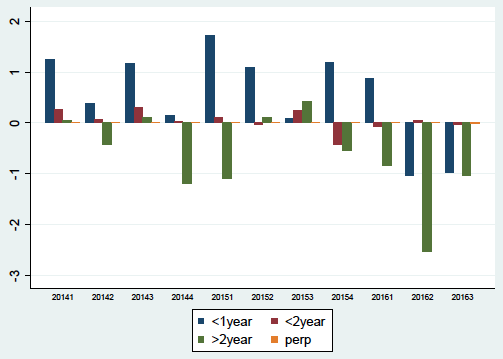 We apply panel regression to model net transactions in a range of asset types by individual investment funds as a function of the anticipation and purchasing phases of PSPP. We include controls for macroeconomic developments that normally affect rebalancing, and this adds evidence for the tentative conclusions of the graphical analysis. The econometric evidence shows that original holders of PSPP assets rebalanced their portfolios toward bonds issued by deposit-taking corporations when these were mainly non-Eurozone assets. This rebalancing was significant only in the period after the programme was scaled up. This perhaps reflects the perception at this time that a turnaround in monetary policy would occur sooner, and faster, in the US than in the Eurozone. Overall, despite some indications of extensive effects from graphical analysis, we found little statistical evidence of rebalancing towards euro area equities or corporate bonds attributable to the PSPP. Authors’ note: The views presented in this column are those of the authors alone and do not necessarily represent the official views of the Central Bank of Ireland. Den Haan, W J (2016), “Quantitative Easing; Evolution of economic thinking as it happened on Vox”, A VoxEU.org eBook, CEPR Press. Krishnamurthy, A and A Vissing-Jorgensen (2011), “The effects of quantitative easing on interest rates: Channels and implications for policy”, Brooking Papers on Economic Activity, 215-287. Marcucci, J and G Zinna (2017), “The Portfolio-Balance Channel: Evidence from Italian Mutual Funds”, mimeo. According to a recent analysis of Dealogic data by Societe Generale (CIB Division), growth in issuance of corporate (financial and non-financial) and sovereign debt since the start of EAPP has been negative until the end of 2016 and is forecast to grow by 2% in 2017. This does not account for maturing debt. Data on net issuance from the ECB’s Statistical Data Warehouse show a recent stabilisation of net new issuance of debt and equity at positive levels, but still well below pre-crisis levels. According to the ECB, Eurozone investment funds hold €834.4 billion of Eurozone-issued sovereign bonds. Our PSPP holding funds sample hold roughly half of their €340 billion portfolio in Eurozone sovereigns. While it is entirely possible that high net-worth individual investors increased their personal cash holdings, this is not a behaviour that we observe, and we therefore assume that non-cash assets were preferred. These funds represent 2.7% of the Eurozone funds industry, smaller than the Irish funds, though findings are similar. There is more evidence of rebalancing towards equity and corporate bonds in the Italian case, but most significant effects were toward non-Eurozone assets.